Mumu is actually a way in which Papua New Guineans cook. Although now there are ovens available in some households, the cooking mumu style is a tradition that still continues today. The typical mumu is a pit that has fiery hot coals placed inside. Banana leaves are next and then the food. 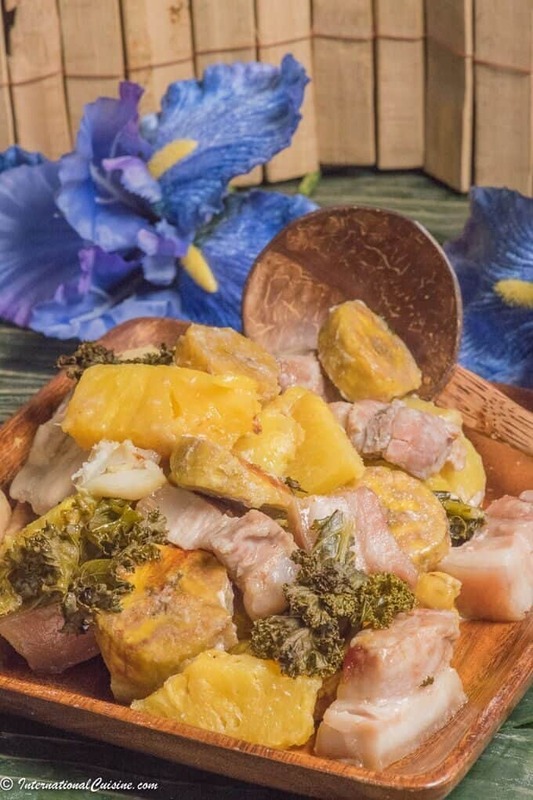 The food is placed with root vegetables and starches like plantains on the bottom, next the meat then the fruit, followed by leafy greens. The whole thing is wrapped up further in banana leaf to make a steamer environment inside the package. Some tribes cover the top with soil and for some that is taboo. Some mumu is cooked dry while others are cooked wet with coconut milk which is how I made this recipe. I did not have a pit so I lined a aluminum tray with banana leaves that I picked up at my local Asian store. I then layered the ingredients, first the kale, then the root vegetables and plantains. Next was the pork belly and chicken pieces, followed by the pineapple and another layer of kale. The meat was salted and a lime squeezed over the top. Coconut milk was next before covering it up with another layer of kale and finally more banana leaf. Aluminum foil was placed over the whole thing to allow the ingredients inside to steam. I then fired up my grill and cooked the mumu on high heat for about an hour. You just want to make sure the pork and chicken are cooked and the root vegetables tender. I am sure you could do this in the oven as well I would try about 400 degrees f. and check on it after about 45 minutes or so. We absolutely loved the dish, the pineapple was a perfect combination of flavor with the pork belly. It was hearty and made a ton, perfect for any family gathering or celebration. Did you know that Papua New Guinea is the most linguistically diverse country in the world? If you would like to learn more be sure to check out “Our Journey to Papua New Guinea” . If you are looking for other dishes from Papua New Guinea check out saksak and kokoda fish. I made a little video for you to see how easy it is to put mumu together, be sure to let me know how much you loved it in the comments below. Please note that this recipe if Plant Paradox friendly provided you use pasture raised chicken and humanely raised pork. If you would like to order the Plant Paradox book and learn more click here. 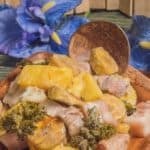 This dish is a tropical delight that cooks up in one pot. The dish is also plant paradox friendly if you use pastured chicken and humanely raised pork. It is hearty and delicious! In a large aluminum pan Place a layer down of banana leaf. Sprinkle the salt over the meat. Put the pineapple over the meat. Squeeze the lime quarters and throw them in as well after squeezing. Cover with the remaining kale and cover with the rest of the banana leaf. completely cover with a piece of aluminum foil. Place BBQ on high heat and let cook for about 1 hour. Open up to make sure that the meat is cooked through and root vegetables are tender. It may take longer depending on how hot your grill gets. Serve hot and enjoy!